So, what are the greatest American stamps? This is the question that Donald Sundman and Janet Klug answer in their book, 100 Greatest American Stamps. They went through a detailed process to determine the American stamps that could arguably be considered the greatest. They interviewed many stamp dealers, collectors, historians, and designers to put together a shortlist of 165 postage stamps to be considered for this honor. 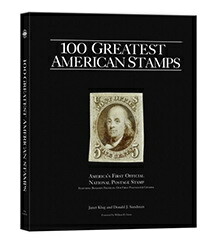 The American Philatelic Society (stamps.org) members helped them to rank the stamps from 1 to 100. The results of this comprehensive process are presented in their book. - Was it a stamp of great beauty? - Was it a stamp first? - Is the stamp historically important? - Is there a great story behind the stamp? The 1969 10 cent Moon Landing. This stamp was printed from a die that was made from an engraved steel plate that travelled to the moon on the first moon landing. The stamp commemorates the first moon landing that happened eight years after President John F. Kennedy set the goal in 1961 to put a man on the moon. On July 20, 1969 Neil Armstrong made the historic first step for mankind. 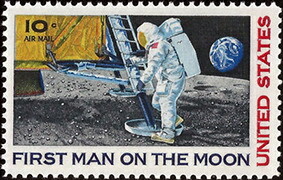 The moon landing stamp was first issued on 3 September 1969. 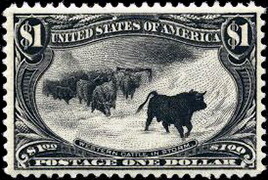 The 1898 $1 Western Cattle in a Storm is considered one of the most beautiful stamps ever issued. It pictures cattle weathering a storm in the American West. However, the stamp artwork is based on a painting depicting cattle in the Scotland Highlands in a snowstorm. 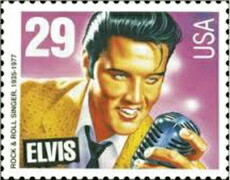 The 1993 29 cent Elvis Presley stamp also made it into the Top 100. It is the most popular stamp ever issued by the US Post and shows Elvis with a microphone in his early years when he was too hot to be shown fully on TV – he could only be shown from the waist up. People queued up to get this stamp when it was first issued and the post offices around America played Elvis Presley songs.